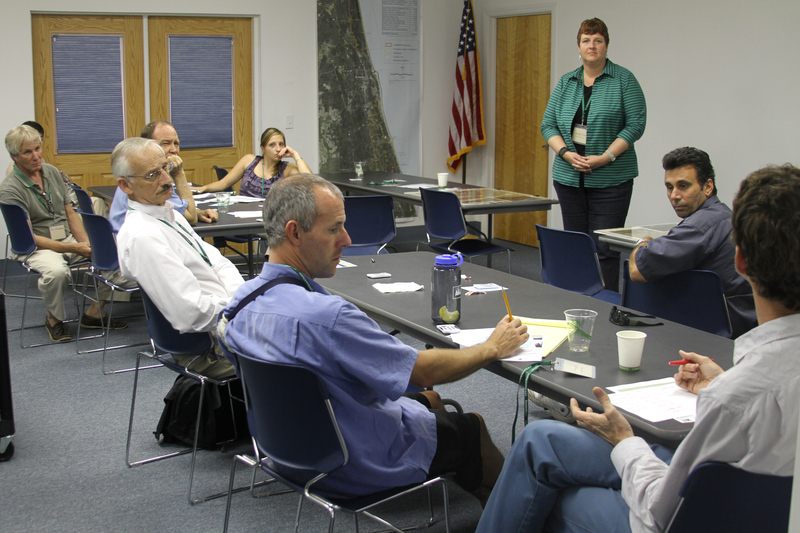 Community residents and game developer Briana Ozor (far left) are shown participating in the Sea Level Rise Adaptation Strategy Role-Play Game at Flagler College, St. Augustine, in December 2012. For our stakeholder workshops, Dr. Dawn Jourdan and University of Florida master’s student Briana Ozor developed a role-play game involving sea level rise adaptation strategies. Participants play in groups of five and each person takes on a different stakeholder persona: local resident, government official, environmental scientist, ecotourism business owner, or inland developer. Each player has a certain amount of money, and the object of the game is to work together to “buy” different sea level rise adaptation strategies to help their community plan for sea level rise. Adaptation strategies include seawalls, beach nourishment, raising buildings, coastal ecosystem restoration, steering future development away from the coast, habitat migration corridors, aquifer recharge easements, and planned relocation of existing coastal development. The game supports an active, applied learning experience. Not only does the game give workshop participants time to interact with each other, it sparks important dialogue among players as they navigate their roles and select strategies. 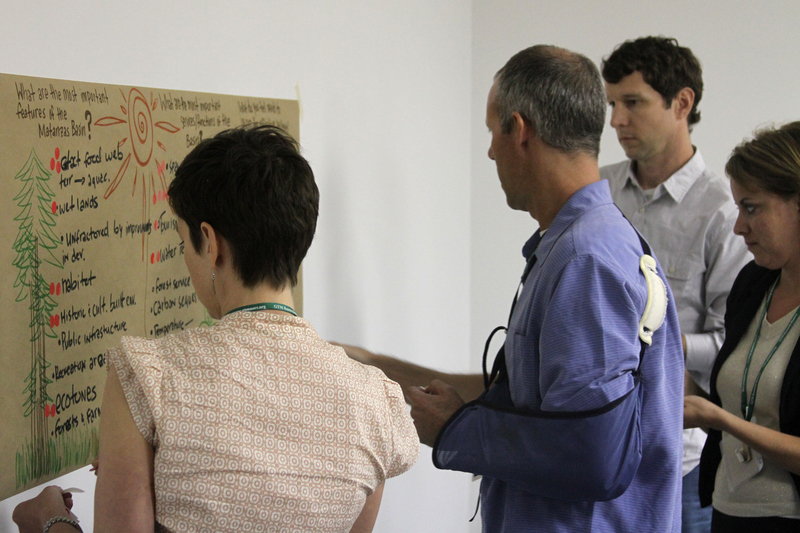 Participants may explore adaptation strategies that they had not fully considered before. For instance, many players learn about the option of installing living shorelines as an eco-friendly alternative to seawalls. Many participants note the learning benefit of putting sea level rise planning into economic terms. Others note how seemingly opposing viewpoints (the environmental scientist and inland developer, for example) may benefit from the same strategy. Although it can be challenging to play an unfamiliar role or to come to group consensus, players leave the game with a different perspective of sea level rise planning. In the end, participants say the game illustrates the importance of having all stakeholders represented at the table. Through this simulation, it becomes clear that the future of sea level rise adaptation planning depends on collaboration, negotiation, and innovation. 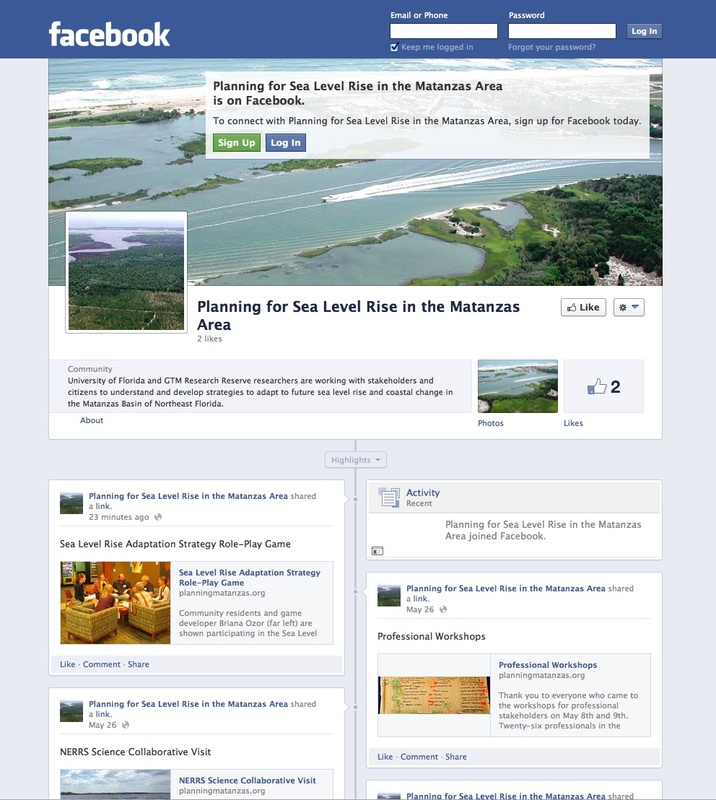 More information is available in this Sea Level Rise Adaptation Strategy Role-Play Game fact sheet. Game materials are available by contacting Dr. Kathryn Frank.